Let’s talk creative rehearsal dinner ideas. Because… want to know what’s truly, mind-blowingly exciting about wedding planning? Somewhere, in the midst of place settings and dress fittings and venue deposits, you are figuring out how to get almost all of the people who are important to you (and your partner) in one place, at one time. For everyone else: when else in your life does this happen? It’s a rare and magical occasion that inspires people drop everything in their lives and flock to you from all ends of the earth. I KNOW RIGHT? There’s a catch though. If you’ve ever hosted a sizable gathering, you know that it’s practically impossible to spend quality time with everyone. That’s reality. There’s a lot to coordinate the day of (that’s why “day-of coordinator” is literally a career), and you’ll be pulled in so many directions you’re lucky if you’re left alone long enough to eat a decent meal. In fact, if you have a large party that requires a ton of face-time, badass wedding planners have been known to pack the newlyweds a to-go box for the post-reception adrenaline crash. So, what do you do if the idea of spending only fifteen minutes with each of these super special people doesn’t seem like… enough? That desire is, in theory, part of why some couples opt to host a more low-key (and sometimes smaller) event the day before. Traditionally, that event is the “rehearsal dinner,” but those words often bring to mind stuffy restaurants where you have to stress over things like seating, prix fixe menus, food allergies, and budgets. Not fun. But guess what—if you decide to throw a party the day before, it doesn’t have to look or feel like a “rehearsal dinner” at all! In fact, you can have a rehearsal breakfast if you want! The point is, you just want to spend more time with loved ones (awww). 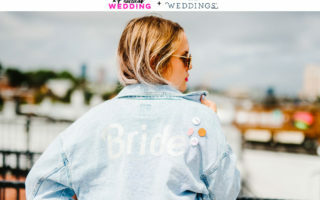 But maybe you need rehearsal dinner ideas that are not… so lux and complicated they seem five times as nice as your wedding? Well, here we go. First up, do you even have to have a rehearsal dinner? The real answer is only you (or possibly your mama) know for sure. In some parts of the US a rehearsal dinner is considered beyond mandatory. In other parts of the country people can take it or leave it. So if you’re not sure if you want one, ask around and see what the reaction is… (and then decide if you care). Who comes? Traditionally, the rehearsal dinner was only for immediate family, the wedding party, and their dates. You know, the people that would otherwise be at a wedding rehearsal. But these days, rehearsal dinners often include everyone in from out of town, or just… everyone. In short, that means you have a lot of control over how big or how small you want to make this thing. Who pays? Traditionally, the rehearsal dinner was paid for by the groom’s family (since, you know, the bride’s family paid for everything else). But thankfully those days are long gone. That means the rehearsal dinner costs are generally just split up as part of the general wedding expenses. Though, if one or the other of your parents WANT to pay for it? I say, let them! Does the rehearsal dinner have to match the wedding? Nope! In fact, the more different, the better—there’s no use in throwing two of the same party back to back. What about toasts? Back in the day, the father of the groom got to do his toast here, because you know… he paid for it, and only men speak, and a lot of terrible traditions. These days, think of the rehearsal dinner as a place to knock out some of your more long winded toasts. (Like chatty Uncle Hank… get his toast done here instead of stealing dance floor time at the reception!) And yes. If there is a groom, and he has a dad, and said dad wants to toast… let him. Does it have to be dinner, and does it have to be after the wedding rehearsal? Not at all. Brunch? Cocktails? A softball game and picnic? The answer to all of these questions is, yes! Anything else I need to know? Try to start and end relatively early, and don’t make it a total booze fest. You, and your guests, don’t want to be hung over or terribly sleep deprived the next day for the main event. Now for some fun rehearsal dinner ideas! This is a common and super laid-back idea. (But don’t forget fifty-plus people in your house is just that: fifty-plus people in your house.) Maybe you had toyed with the idea of a potluck style wedding reception but decided against it—this is the perfect time to run with that! Maybe the hosts are in charge of barbecuing the main dishes, and ask guests to bring sides and desserts. Or perhaps you hire a few food trucks for a fun vibe. Really, though, all you need is some food, tables and chairs, paper plates, and good tunes! This is a fun, and relatively easy theme to pull together. Most Mexican food restaurants will cater for really reasonable fees, as will local taco trucks (and um, Chipotle). Order some papel picado flags and start the party! This works great as an “open house” style party. You and your partner pick a location and a set time frame (Larry’s Bar from 6pm to 9pm) and your guests can come and go as they please. Some bars and restaurants can help you set up a tab for guests, you could give out drink tickets, you could pay for some appetizers, or you could just let guests pay for their own beverages while you all hang out together. This could be at a fun bar with pool and darts, or tell everyone to dress up for a fancy fun cocktail hour at a lounge. Either at a local pizza restaurant or at home, everyone loves pizza and can enjoy a pizza party. I’ve seen it done with take-and-bake style pizzas at home and with pizza delivery. There are also traveling wood-fire pizza oven caterers who will come cook fresh hot pizza for your whole party! Turn on some music, or hire a local band or musician, and this will be a pizza party no one will forget. It’s pretty traditional to have a rehearsal dinner in a restaurant. Most restaurants will help you do a partial or full buyout so that you and your whole crew of people will be well taken care of (or you can go simple, and make a reservation for your group). Just don’t feel trapped into picking a boring restaurant. You could go with somewhere fancy, somewhere laid back, your favorite local ethnic restaurant, or even a sports bar and grill. Go with something you and your partner both love so you can share it with your family and friends. Think surf music, tropical floral, and a pig roast. Turn your backyard, or the local park (no need for a shore,) into a mini-vacation for you and your guests. Keep it casual and fun. If it’s the summer, a pool would really seal the deal for a fun backyard beach party. Think of it like the traditional cake and champagne church reception, but for your rehearsal dinner. Ask family and friends to bake desserts, or order up a little dessert bar from a local bakery. Have some drinks on hand, and let it be an open house-style party for a few hours. This way guests can go to dinner anywhere they wish (aka you don’t have to negotiate the someplace that’s both paleo and vegan friendly), but they still get to spend time with the two of you! This one takes a little planning, but could turn into the most fun anyone has had all year. Plan ahead (by which I mean, have a friend or loved one plan ahead) and give guests their character and costume information before they are leaving for the wedding weekend. Get people on board, in costume, and excited about the theme. Before you know it everyone will be mingling, laughing, and getting to know each other. The only question left is… whodunit? Look for a local bowling alley or arcade. Rent the space, or a few lanes, and get everyone together for an evening of cosmic dance party bowling or PacMan championships. With a little research you may be able to find something really outside the box and fun. Think: Skeeball Warehouse, Roller Rink, Dance Studio, Art Studio, a Zoo, a Comedy Club, or even a roaming party bus! Try not to let the rehearsal dinner plans be the thing that stresses you out. Ask for help, be creative, and have fun. Remember, it’s just another opportunity to spend time with your community of family and friends while they’re all in the same place at the same time. Did you have (or are you planning) a creative Rehearsal Dinner? Tell us about it!